Fire (Sagittarius) and Water (Pisces) really can mix. This couple will dream big, urging each other on with their views of a limitless horizon. Their respective approaches may differ, but their ultimate goal is the same: to escape. Venus in Sagittarius is Queen of the Wanderers. Restless in mind and body, she’s on a journey that never ends. She can see the potential in almost anyone, but Ms. Sag does need a partner who can keep up with her. Easily bored, she wants a lover who can challenge her in and out of the bedroom. As a playful and optimistic partner, she can be counted on to book the next vacation. But don’t depend on her to do the dishes. Venus in Sagittarius would rather not deal with the daily grind. She can also be painfully blunt, because she’s too busy planning her next adventure to notice when her partner’s feelings are hurt. Mars in Pisces is King of the Dreamers. Here is the sensitive lover, overflowing with passion and a psychic understanding of his partner’s desires. Mr. Pisces can seem like the answer to his lover’s prayers until she realizes that he spends half his time in a dream world. Day-to-day life can be a bit much for Mars in Pisces, and he’ll do his best to evade confrontations, arguments and taking out the garbage. He can either drift out of a relationship or chain himself to a partner in the ultimate romantic sacrifice. When the Wanderer and the Dreamer get together, you know that a Big Romance is on. Venus in Sag will take the lead with her straight-shooting charm. Mars in Pisces will believe he’s found his soul mate—and in many ways he has. Sagittarius can fuel Pisces’ dreams and Pisces can tune Sag in to the emotional subtleties of human interaction. The only downside: this couple will be so focused on exploring the unknown that nothing will ever get done around the house. Overall, this can be a passionate and creative pairing that never loses its magic. 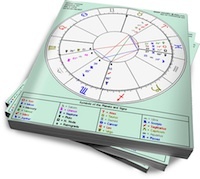 Nadia Gilchrist offers over 19 years of experience in astrology. Her writings and personal consultations focus on applying practical astrological analysis to the real world. Nadia blogs regularly at Ruby Slipper Astrology. First of all, that was beautiful. It’s lovely that you have found someone who inspires you so much and makes you feel that way. Second, only speaking from experience (I can’t really speak for her), she probably is quite attracted on her part. I have Cap Sun/Virgo Moon/Sag Venus/Aries Mars: a couple months ago I came into contact (indirectly) with an Aqua Sun/Aries Moon/Aqua Venus/Pisces Mars and he’s been stuck in my head ever since. It’s strange because there is part of me that realizes that I shouldn’t like him at all, that he’s not even my type (I am usually attracted to Gemini and Aries, whom I don’t seem get along with, thanks Venus & Mars), and that we don’t even know each other and probably never will. Knowing all of this, there is still a big part of me that keeps thinking he’s exactly what I want and need, and I can’t seem to stop thinking about him. He’s also inspired me artistically and career-wise (that could be his Venus conj. my MC, Merc/Mars conj. my NN/opposite my Moon). Anyway, just be patient with her is my advice. A Cap Sun alone will take a while to warm up completely to a relationship, but the Sag Venus could make it difficult to commit to a serious relationship(again from experience), even though the Sag Venus could also make her want to immediately jump into the fun part of a relationship with both feet without thinking. Just don’t put too much pressure on her, and let her be herself and do her own thing and you do your own thing (I’m sure you won’t have too much trouble with this being Aquarius Sun/Gemini Moon/Sag ASC).